The Hop Farm, as its name suggests, was once a large hop producing farm owned by a famous London brewery. 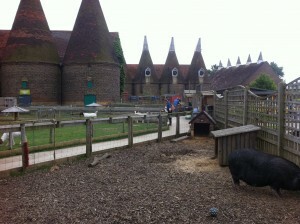 The farm is still dominated by the enormous oast houses, now housing various attractions. If you are interested in the history of the farm, and the tradition of inner city London families travelling to the farm each summer on “holiday” to pick the hops, the Hop Story exhibition situated in one of the oast houses is well worth a look. 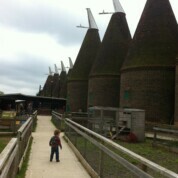 Admission to The Hop Farm is free, but you have to buy tokens for some of the on-site attractions. We visited on a term-time weekday when some of the attractions were closed, but we were able to visit the farm and use the outdoor play area (both free). The compact farmyard was a hit with MJ – animals included Shire horses, Shetland ponies, llamas, Kune Kune pigs, goats, pygmy goats, donkeys, rabbits, ferrets, ducks and more. The outdoor play area was also popular and has plenty of picnic tables if you want to bring your own lunch. It started to rain so we headed inside to the soft play area (£1.50) and café. The soft play area is a reasonable size but shows some signs of wear and tear. It was overrun for a while by a school party, but once they had left MJ pretty much had the place to himself. There are lots of other activities which are open at the weekend, but these mostly attract a fee. It seemed that the prices ranged from £1 to £5 depending on the activity – the large jumping pillows and medieval castle costs £1 to enter, the bungee trampoline costs £5. Other attractions include crazy golf, Farmula 1 (geddit?) go carts, bumper boats and a 4D cinema pirate ship. It’s up to you how much you spend and there are enough free things to do to enjoy a low cost day out if you want to. A fun destination for families with small children and no need to break the bank as entry and some of the attractions are free or low cost. 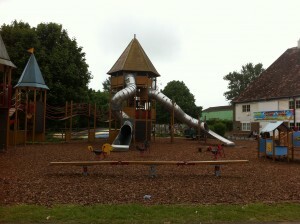 Entry to The Hop Farm is free, as are the farm, exhibition and outdoor play area. The other attractions require pay-as-you-go tokens. The Hop Farm is open from 10am to 5pm. On term-time weekdays only the farm, outdoor play area and soft play area are open. Check website for details of seasonal opening times. 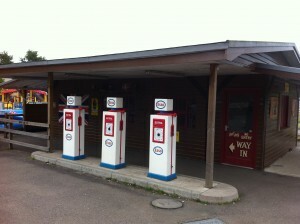 The site is accessible to pushchairs. There are baby changing facilities. There are two cafés on site – one in the soft play area (Safari café) which serves hot and cold drinks and snacks and a more formal café (Olive Stores) serving hot and cold drinks and meals.